A Question Of Sport - Do You Remember? First broadcast c1972. Hosted by David Vine with teams captained by Cliff Morgan and Henry Cooper. Much more amusing then than now as Henry and Cliff got laughs by making jokes against themselves rather than scoring points off each other in the manner of Parrot and McCoist. The guests in those days were almost exclusively from mainstream spectator sports: Football, Cricket, Athletics etc. Guests from the world of Squash, Judo or fencing were almost non-existent. Although entertaining, it had much greater appeal to sports fans, unlike today, where it is essentially a half hour of (not always funny) comedy. Do You Remember A Question Of Sport? I agree that what was once I good sports quiz show has become a second rate comedy - like listening to some blokes down the pub making each other laugh. (Top Gear has gone the same way). I was not really into sport but I loved watching this show. Maybe because Emilyn Hughes' voice cleared my ears of wax. In the early years, A Question Of Sport was more akin to a working class University Challenge than a high-brow sports quiz show. Let's face it, David Vine was and always will be a bloke who looks like a Physics Teacher. The time I remember most of all is the period when Gareth Evans, Willie Carson, Emlyn Hughes and Bill Beaumont seemed to share the captain's chairs. Of course, Willie Carson and Emlyn Hughes were the jokers in the pack (I'll never forget Emlyn Hughes saying Sally Gunnell was "fit in the looks sense", but could the same be said now?) whereas the egg chasers (Evans and Beaumont) just seemed to looked a bit bemused at the whole TV experience. 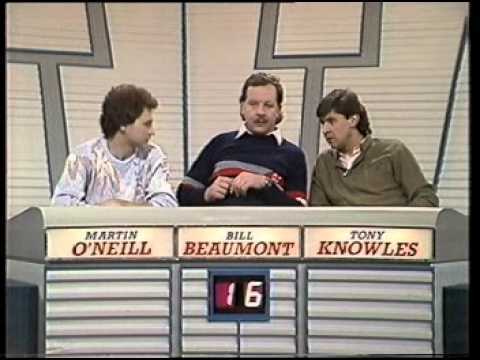 Back then it was an out and out sports quiz show, and easily the best in it's field. ITV tried and failed on numerous occasions to "do" sports quizzes, but on numerous occasions failed - Body Heat and Sporting Triangles being the most notable failures. Having said that, Bullseye held its own for years and years, but Bullseye was never a primetime midweek show. A Question of Sport therefore remained untouchable for almost three decades until They Think It's All Over arrived and, by combining Have I Got News For You with A Question Of Sport, made sports satire (or "Sportire") the thing to do on TV. The joke, of course, wore thin after a couple of series of listening to a Stoke City fan badmouth Manchester United, Arsenal and David Beckham week in week out, but the producers of A Question of Sport had already made changes to the set, the theme tune and, sadly, the format. What we're left with now is a quiz show trying to be a pre-watershed comedy show, and the result is like a chicken in a basket sports quiz for all the family to play before the kids go to bed and the rude jokes begin. Honestly, the board game was more entertaining than QoS in it's present form will ever be, which is why everyone waits for the What Happens Next? round to end before switching over. I remember Bill Beaumont having the biggest, scariest Moustache in the world! And Emlyn Hughes talking like a girl!